Amery Ice Shelf: East flank of Antarctica, south of the Indian Ocean. Amundsen Sea: waters west of the Bellingshausen Sea and at the south end of the Pacific Ocean. 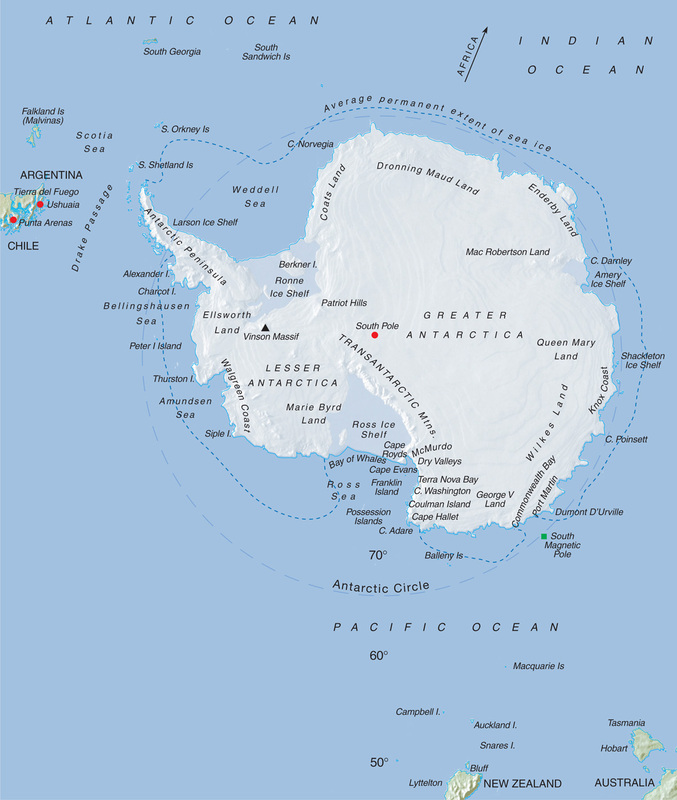 Antarctic Peninsula: The one prominent peninsula in Antarctica, reaching toward the southern tip of South America. Bellingshausen Sea: waters west of the Antarctic Peninsula and at the south end of the Pacific Ocean. Brunt Ice Shelf: in northern Antarctica, to the east of the Weddell Sea. Drake Passage: the stretch of water between Antarctica and the southern tip of South America. Larson Ice Shelf: along the east side of the Antarctic Peninsula. Ronne-Filchner Ice Shelf: the large ice shelf feeding into the southern reaches of the Weddell Sea. Ross Ice Shelf: the large ice shelf feeding into the southern reaches of the Ross Sea. Ross Sea: the largest Antarctic sea, to the east of the Antarctic Peninsula and at the south end of the Atlantic Ocean. Shackleton Ice Shelf: along the east coast of Antarctica. Weddell Sea: waters east of the Antarctic Peninsula and at the south end of the Atlantic Ocean.